This is a guest post by My Patch of Blue Sky by Debbie Hayes. 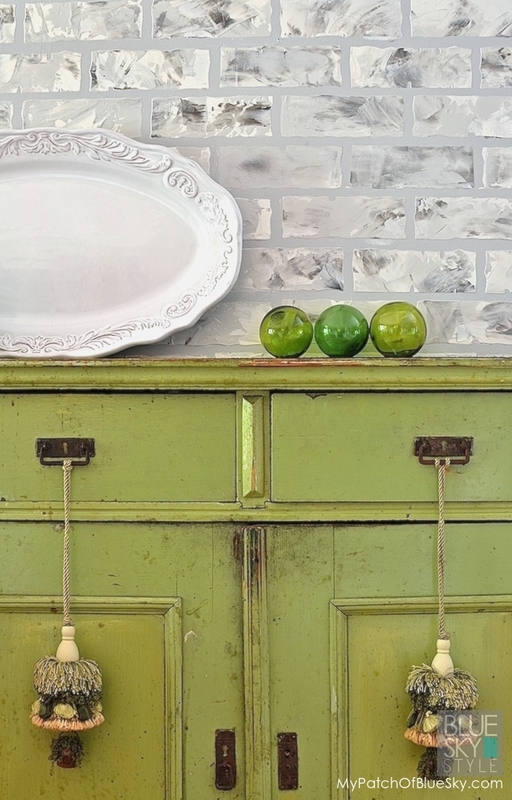 Recently I posted about painting our fireplace brick and mantel with Fusion Mineral Paint. It was fast, inexpensive, and provided the immediate gratification I crave! Just a bit of cleanup to begin with and I had a fresh, new look in about an hour and a half, no sealer coat required. While I was painting, I thought about folks who do not have a brick fireplace – maybe just drywall above their mantel, or even no fireplace at all. I realized that Fusion has a wonderful option for creating the faux brick look! They offer a stencil shaped like authentic brick that can be used for painting what I call southern-traditional-style brick. You know, terra cotta and browns. Or, like my new favorite, a cool, contemporary color scheme, using soft grey and white textures. 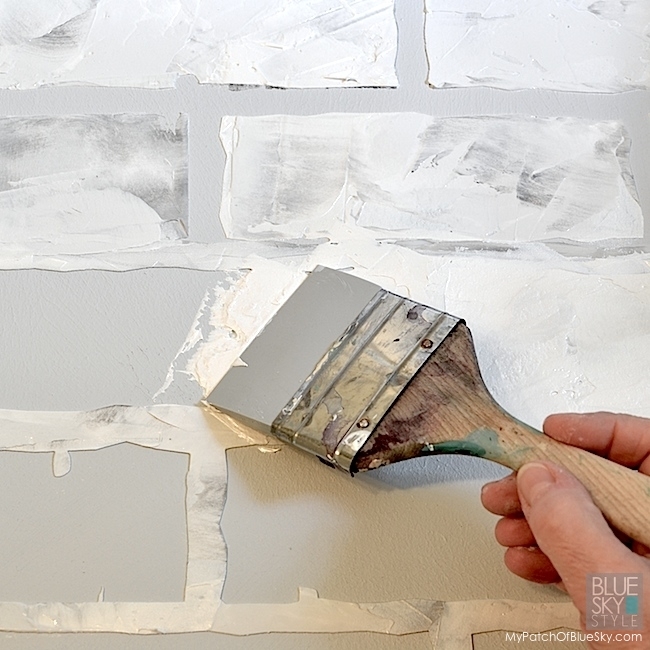 Sadly, having been a faux finisher forever, the walls in our home are plastered, painted, and stenciled, with not an inch to add a faux brick finish. But, I went junkin’ in our own back yard, amongst Steve’s contractor left-overs and found a huge scrap of plywood to play with. Look how clean and modern this wall I stenciled is. I accessorized simply, with a huge white platter and pops of chartreuse from the glass fish floats. 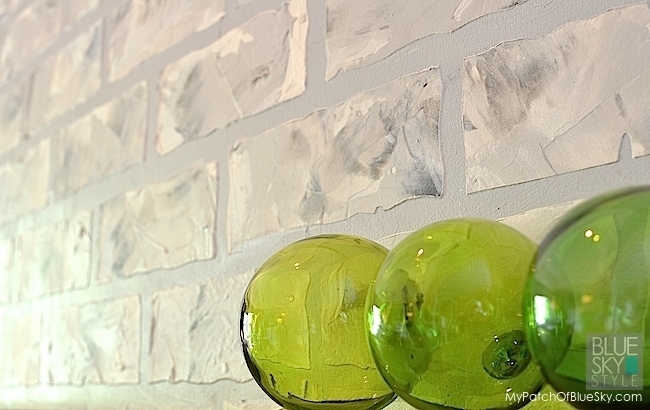 I’m now thinking that this would be a great-looking kitchen back splash. Just add Clear Tough Coat for protection. Want to give this technique a try? Here goes – you won’t believe how fast and fun this process is! No worries about what’s underneath. This board was black, and I painted 2 coats of Sterling, then let dry. 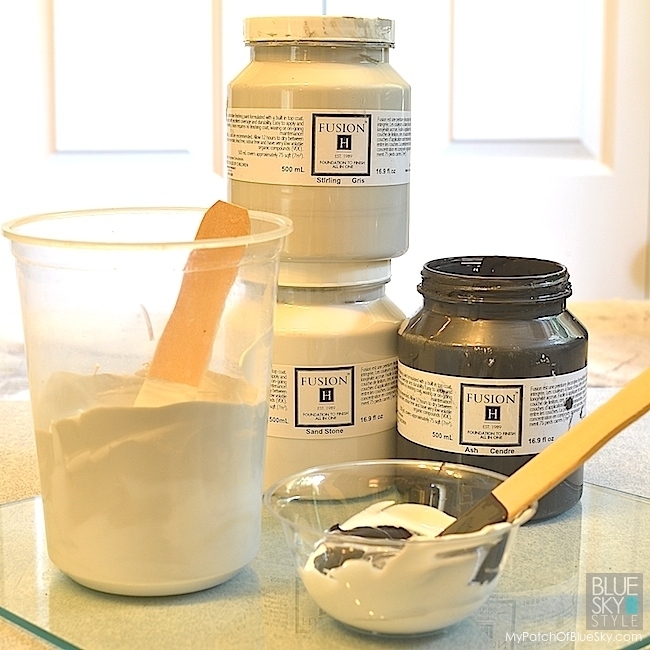 Mix some Sterling into a container with some Sand Stone Texture – about 2 parts Sand Stone, 1 part paint. Mix a small amount of Ash into a bit of Sand Stone. You can work on the wall with this stencil, and the beauty of it is that you don’t have to wait for the products to dry before repositioning the pattern. Brilliant! Put down your drop cloth. If you have a ladder with a tray, great. You can tape your palette on to keep your hands free. Use push pins or tape to anchor the stencil it in position. Start at the top, and work out and down from there. 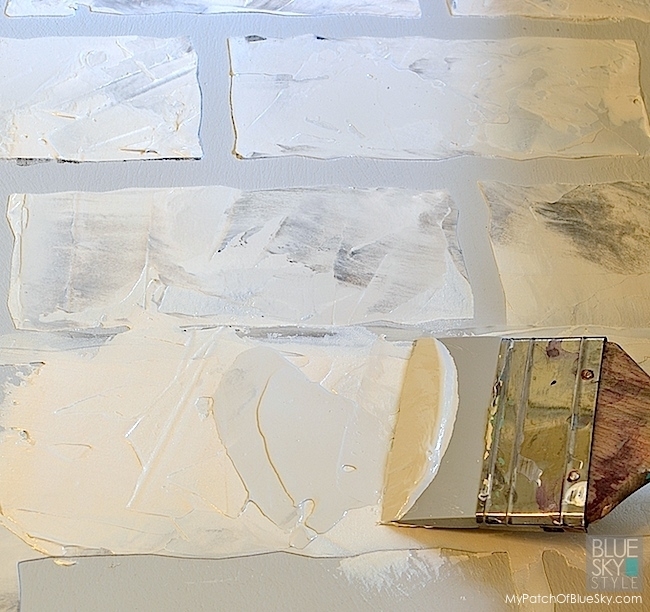 Put a lot of Pearl Embossing Paste on your tool and lay your hand at a very low angle to the surface. With no pressure at all, pull the product across the stencil. 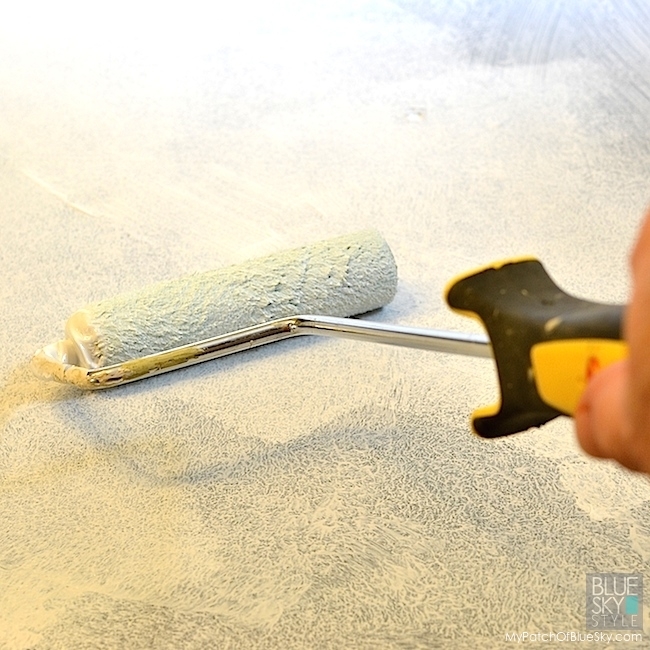 Don’t work it like a paint brush, just let the material lay where you placed it. Change the angle of the tool often. 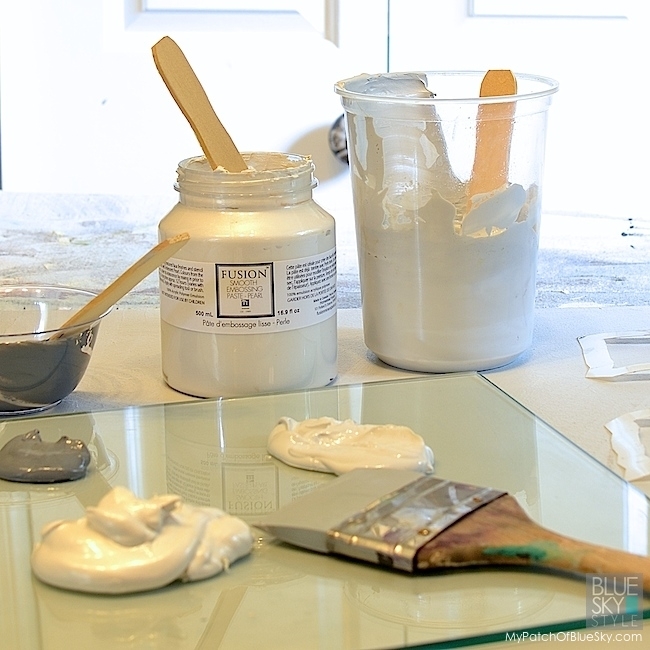 After you finish the entire stencil with Pearl, leave the stencil in position and add areas of the Sterling mix. On your palette, it almost looks white, but there is a color difference, I promise. Then add in just a very few touches of the Ash mixture. While you’re working you can peel up the stencil to see your progress, then lay it back down to make color adjustments. After it all dries, the colors will be a bit darker. 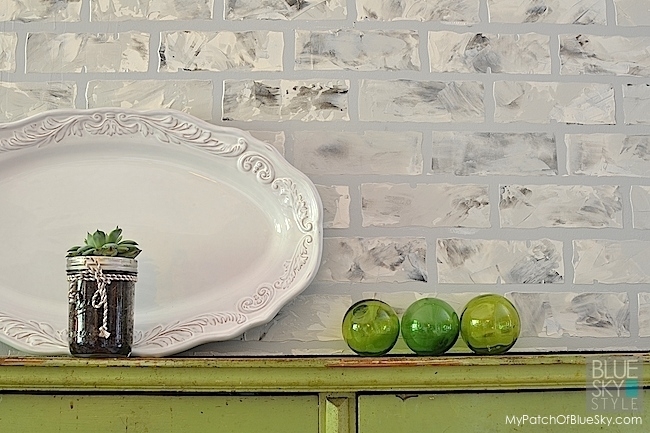 If you get some material on the Sterling grey “grout” just paint over it with a small brush. 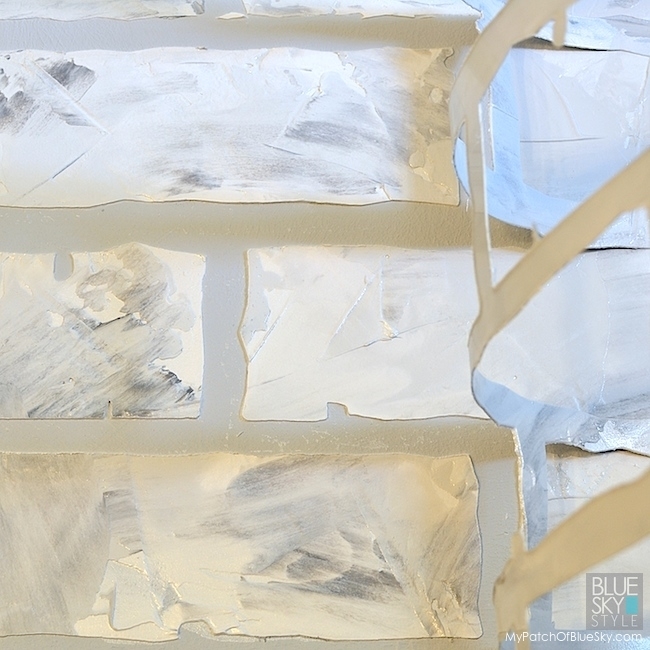 For under $100, which includes the stencil, the paint, the Sand Stone and Pearl Embossing Paste, you can paint about 100 square feet of wall – a feature wall, several back splashes or two fireplace feature walls. The ambiance you have created is so high end, and it lends itself to accessorizing with almost anything – from modern to vintage – beautifully. Dying to get this look? 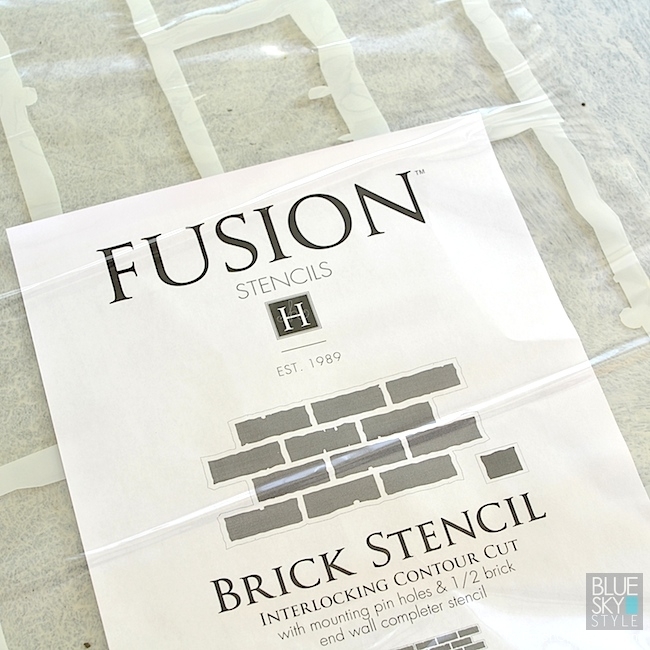 Here’s where to find your local Fusion Mineral Paint retailer.